What’s next for “Rowdy” Ronda Rousey? The World’s most dominant female athlete just came off a 34-second, knockout win over Brazilian challenger, Bethe “Pitbull” Correia. Rousey’s dominant victory was expected by most and predicted by many. 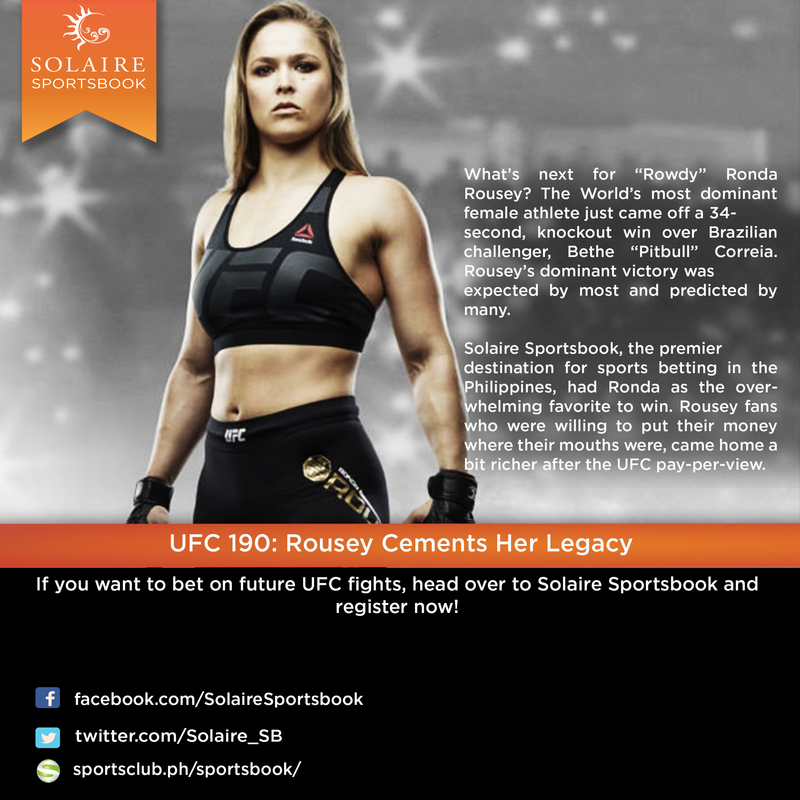 Solaire Sportsbook, the premier destination for sports betting in the Philippines, had Ronda as the overwhelming favorite to win. Rousey fans who were willing to put their money where their mouths were, came home a bit richer after the UFC pay-per-view. Now at a pristine 12-0, Rousey has cleaned house in the UFC’s women’s bantam weight division. Not only has she defeated all of her challengers, she has notably dispatched them very quickly, highlighting even more how much higher her level is over the competition. The next opponent the organization has lined up to fight her next, is someone who she has already defeated. Twice. That said, no other challenger has pushed her more than rival Miesha “Cupcake” Tate, and with both fighters already improving their games since their last encounter, it’s fitting that they round things out with a fight trilogy. Rousey clearly has grown to become a more complete mixed martial artist. She was once tagged as a pure, albeit dominant grappler; but she has since worked hard to improve on her striking to improve her overall game. This has not been more evident than her complete destruction of Bethe Correia with strikes. For now, it appears no one at 135 pounds can pose as a worthy challenge for the 28-year-old Rousey and she’s on track to hold on to her belt for years to come. After the win, Ronda decided to leave her UFC belt in Brazil, donating it to Instituto Recao, a judo school owned by Olympic judo bronze medalist Flavio Canto. Rousey, herself, is a two-time judo Olympian and a bronze medalist in 2008. Other results from the event include a unanimous decision victory by seven-foot tall Stefan Struve over veteran Antonio Rodrigo Nogueira. Antonio “Big Foot” Silva took home a TKO win (punches) over Australian fighter Soa Palelei. In the co-main event. Mauricio “Shogun” Rua won by unanimous decision over Antonio Rogerio Nogueira, the twin brother of Antonio Rodrigo. If you want to bet on future UFC fights, head over to Solaire Sportsbook and register now! This article was written for this site by Erik Ong, sports journalist and editor.